The most traditional concept of temporal hollows or concavity is the temporal region between the eye and the temporal hairline. Situated just above the zygomatic arch, deepening of this temporal region is well known to occur from fat loss due to aging, disease (medical conditions that cause facial lipoatrophy) or simply as part of one’s genetics and natural facial structure. 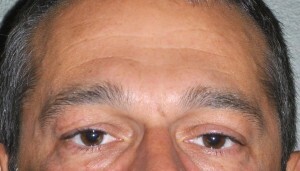 Aesthetic augmentation of this type of temporal concavity is most commonly done by injection techniques using various types of injectable synthetic fillers or one’s own processed fat. While these injection methods do have potential effectiveness, the duration of their effect is not guaranteed nor is the consistency of the augmentation. Preformed temporal implants are now available that provide a simple and permanent temporal augmentation effect. 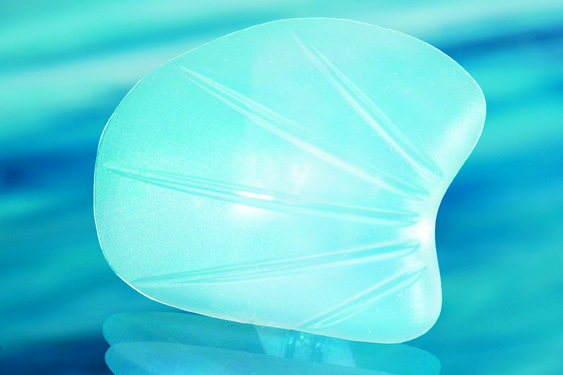 These are very soft silicone implants designed to feel like the muscle tissue that they are placed on. The implants are placed in a subfascial location on top of the muscle through small vertical incisions back in the temporal hairline. For correction of a temporal concavity that extends beyond the lower half of the non-hair bearing temporal region, extended silicone temporal implants can be used to provide an augmentation effect all the way up to the side of the forehead at the anterior temporal line. 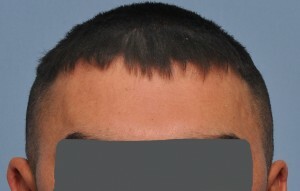 While this style of temporal implant is longer (vertically higher), it does not require a bigger scalp incision to properly position it into place. 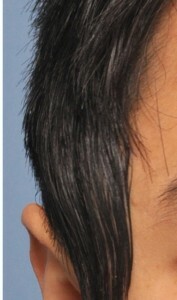 The perception of a head that is too narrow relates to the shape of the side of the head above the ears. This is the posterior temporal region and is actually much bigger than the anterior temporal area in terms of surface area. When the sides of the head lack any convexity (vertically flat), they can look too narrow. Just like the anterior temporal region, the posterior temporal area can be augmented as well by placing a silicone implant either on top of the muscle or even under the muscle. This requires a much larger implant to be used although it does not need to be overly thick. 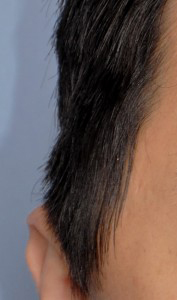 The posterior temporal or head widening implant is usually placed through an incision in the crease at the back of the ear for a completely hidden scar. 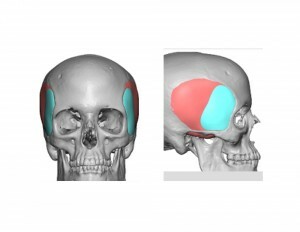 Augmentation of the complete side of the head from the side of the eye back to the front edge of the occipital area can be done using a combined extended anterior and posterior temporal implants. 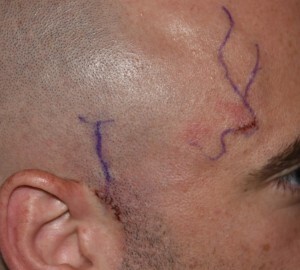 A single vertical incision in the scalp can be used to place both types of temporal implants. 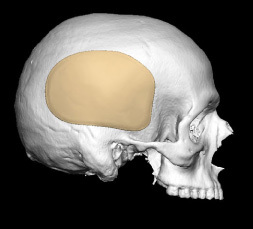 Just like a narrow side of the head can be augmented, an overly convex or too wide side of the head can be reduced. In the anterior temporal region this can only be done using Botox injections. Surgical muscle reduction is not usually done in this area. 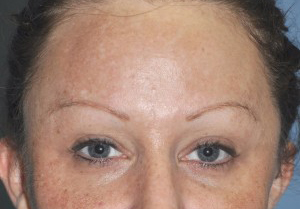 While usually not permanent and needing to be repeated, Botox has a well known history of clinical effectiveness at reducing the size of masticatory muscles. It is also a simple and safe technique that has no known side effects. 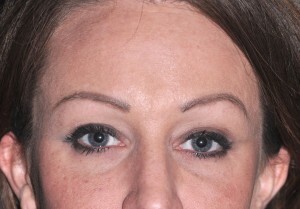 While Botox injections can also be done in the larger posterior temporal muscle area as well, surgical removal of the posterior temporal area provides an immediate and permanent effect. While many think the convexity at the side of the head is due to the thickness of the temporal bone above the ears, the posterior temporal muscle is actually much thicker. By tissue ratios, it makes up a greater portion of the posterior temporal convexity often being as thick as 7mm to 9mms between the overlying fascia and the underlying bone. Removal of the posterior temporal muscle can be done through a small incision behind the ear with an immediate and dramatic flattening of the temporal convexity and width of the side of the head. Removal of the posterior temporal muscle causes no problems with opening and closing the lower jaw due to the size of the remaining anterior belly of the temporal muscle. The superficial temporal artery ascends from the neck in front of the ear to the temporal region and splits into a Y, creating an anterior and posterior temporal branch. This occurs about one inch or so above the ear. 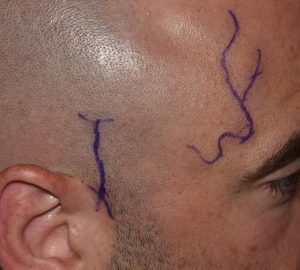 The anterior branch of the superficial temporal artery then leaves the temporal hairline and crosses into exposed temporal skin on its way into the forehead. In some people the size of the anterior temporal branch artery becomes large and visible. When exercising, exposed to heat, bending over or any activity that increases the heart rate, the course of the artery bulges and becomes glaringly conspicuous. It may occur on just one side or be asymmetrically prominent. Creating a long and tortuous bulging vessel, some patients may seek a reduction in its prominence. Temporal artery ligation can be safely done through very small incisions (5mms or less) to decrease its forward blood flow and either reduce or eliminate the prominence of the vessel. At least two points of ligation are always needed (sometimes 3 or 4) to prevent backflow and/or catch unseen branches that may be feeding into it. This is usually done as an office procedure under local anesthesia. It does not have any adverse side effects on the scalp such as hair loss or scalp skin issues.